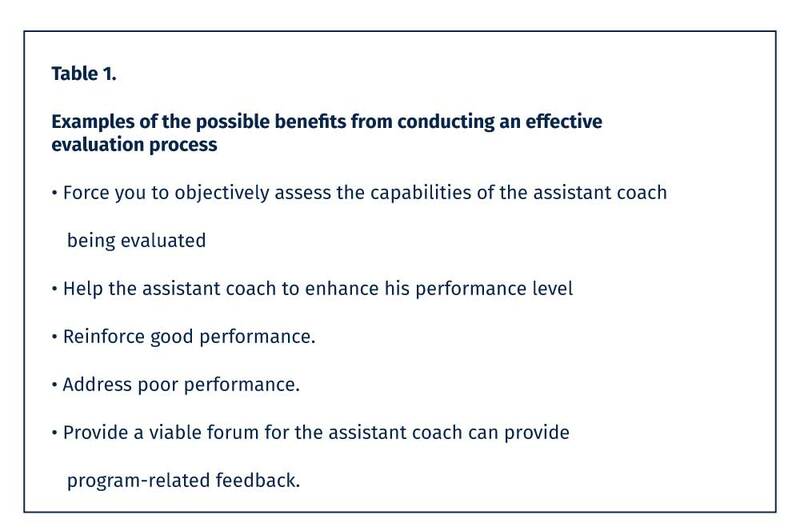 Evaluating the performance of your assistant coaches is one of your most important responsibilities as a head football coach. 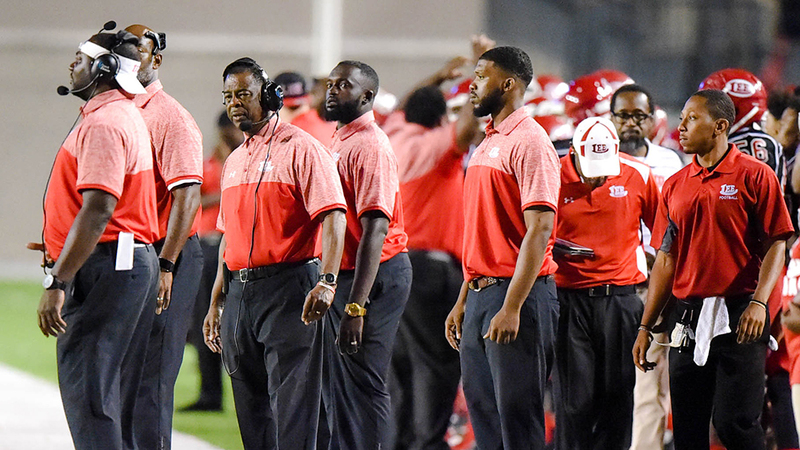 Although many head coaches and probably more assistant coaches don't look forward to these evaluations, they can be beneficial in several ways. An appropriate evaluation process is tied to several key measures, including job expectations, compensation, advancement and career path. The underlying objective of this process is to determine how well a particular staff member is performing at his or her current position. More often than not, the endpoint of the process involves end-of-the-year one-on-one meetings with each member of your staff. During this time, you provide assistants with overview assessments how you feel they have performed their jobs during the recently concluded year. Cover at least four areas of an employee's performance, knowing that for different people, these topics could vary. For example, you could initially point out whatever efforts were successfully undertaken since the last evaluation. Such a step sets a positive tone for the rest of the meeting, and it lets your assistant coach know that you are aware of those accomplishments and how they are important for your program. Let the assistant coaches know that you realize what they do well in their positions. By discussing strengths, you and your coaches together are better prepared to consider what the potential is for new or different responsibilities. Detail aspects of each coach's performance on which you feel he or she could improve. This step is enhanced by concurrently broaching a plan for improving those aspects. Finally, during this meeting, bring up any elements of job performance over the past year that you consider to be problematic. When discussing these disappointments, touch on why they occurred as well as what might be done to avoid them in the future. This phase is also the appropriate time to issue any warnings to the coach, if they are warranted. The assistant coach understands the process - e.g., when, why, and what. The head coach makes a concerted effort to make the end-of-the-year meeting productive. The head coach bases feedback on information documented in writing during the past year. During the performance review, the head coach employs clear, concise, nonjudgmental language that focuses on results and the assistant's behavior. A request that the assistant coach evaluate himself. At best, this is a waste of time. Bringing up problematic concerns that you can't back up with specific examples. Facts and figures are essential. Focusing on personality rather than performance. This is never a good idea. Fixating on near-term performance as opposed to what occurred during the course of the entire evaluation period. This approach short-changes both the assistant coach and your program. Overstating the assistant coach's performance to hopefully enhance his level of motivation. Better options exist. Comparing one assistant coach to another. This is unfair, unhealthy and unworkable. Making promises you can't keep. This will result in unmet expectations. Every assistant coach wants to know how he or she is doing in the job. 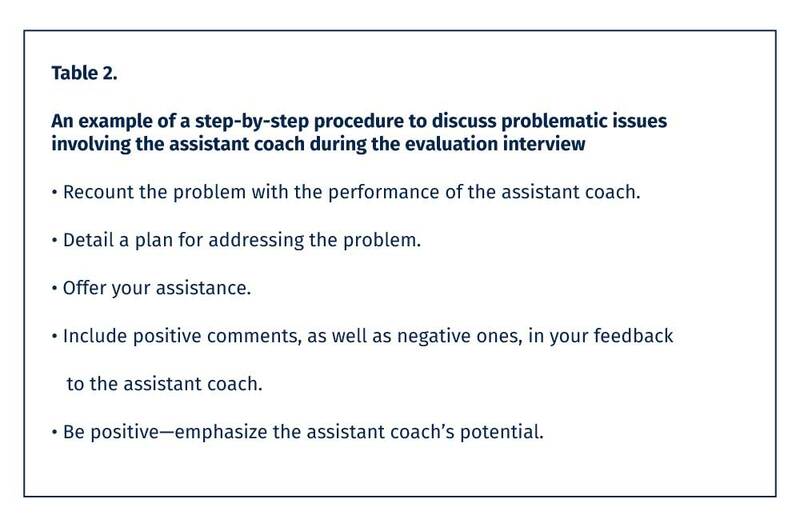 By handling the evaluation process well, your assistant coaches learn what they need to do to become even more valued members of your staff. Dr. James A. Peterson has written more than 100 books, including serving as the co-author of Bill Walsh's "Finding the Winning Edge." A sports medicine consultant who resides in Monterey, Calif., Peterson has been a columnist for ACSM's Health and Fitness Journal for more than 20 years, taught at the U.S. Military Academy at West Point and served as the director of sports medicine for Stair Master Sports Medical Products.